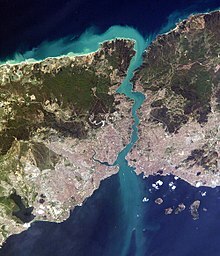 The Bosporus or Bosphorus is a strait that forms part of the boundary between the European part of Turkey and its Asian part (Anatolia). It connects the Black Sea with the Sea of Marmara. It is about 30 km long, with a maximum width of 3,700 metres at the northern entrance, and a minimum width of 700 metres between Kandilli and Aşiyan; and 750 metres between Anadoluhisarı and Rumelihisarı. The depth varies from 36 to 124 metres in midstream. The shores of the strait are heavily populated as Istanbul is nearby. Several bridges and tunnels cross the strait. Wikimedia Commons has media related to Bosphorus. This page was last changed on 1 March 2018, at 04:37.